Wolflight (see review), released in 2015, was one of the best Steve Hackett albums ever and I almost thought that he was at the peak of his long musical career. 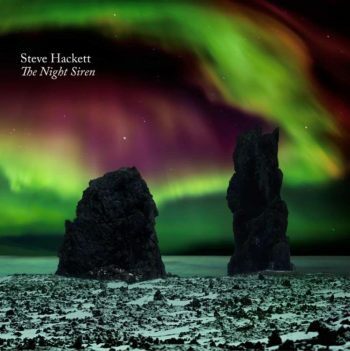 However, now, Hackett brings out his 25th solo album called The Night Siren and it is an absolute, brilliant gem. It seems as if Steve's guitar playing is getting better and better with every year he grows older, as some of the solos on The Night Siren are utterly marvelous and awesome. For me the guitar solos in the songs Behind The Smoke, El Nino and The Gift are some of the best he has ever played and recorded. Especially in the instrumental tracks The Gift and El Nino, they give me goosebumps all over, every time I hear them. But there is a lot more to enjoy on The Night Siren, take for example Martian Sea (featuring Hackett on sitar and guitar), Anything But Love (with excellent flamenco guitar picking), Inca Terra (featuring didgeridoo) and In The Skeleton Gallery, which is a very diverse track. The longest track, which clocks just over seven minutes, called Fifty Miles From The North Pole, is perhaps the best song of the entire album, featuring massive guitar solos and melodies, but also featuring Ferenc and Sara Kovacs on trumpet and didgeridoo and Amanda Lehmann on backing vocals, giving the song a typical atmosphere. The Night Siren shows Steve Hackett at the top of his musical game as the album is so diverse and there are lots of changes of style and tone to discover as a listener. Hackett's ideas, creativity and musicality burn as brightly as never before and it really is a musical treat of the highest order to listen to and enjoy The Night Siren over and over again. The album already belongs to one of the musical progressive rock highlights of the year 2017 and I am sure that this awesome album will end up in my top 5 list of best albums of this year. Play it loud and as much as you can!!! !